Birmingham Mayor Larry Langford’s office sent out a release earlier today supporting the United States Postal Service’s request to potentially reduce mail delivery service to five days a week. The mayor’s comments in the release favors the idea of eliminating Saturday mail, which is what most of us assume the USPS would be suggesting. However, they aren’t sure what day it’ll be if the request is granted by Congress. 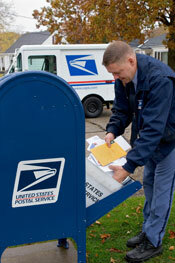 Photo: courtesy of the United States Postal Service.